My Facebook feed has “blown” up the last two days with cultural/religious issues that, quite frankly, have me confused. At first I thought I would just keep my digital mouth shut, but ah heck, what’s the fun in that. These are the kinds of blog posts that get me ‘unfollowed’ but I can live with that. The first one is the White Jesus/White Santa debate. Apparently Megyn Kelly of Fox News spouted out that Santa is white and so too is Jesus, then Jon Stewart did what Jon Stewart does and roasted the woman for her comments. The videos are all over the internet so you can Google them yourself. What I am interested in is why this is a big deal. Is anyone surprised that people say stupid things on Fox News? Who gets their cultural mythos and/or religious information from cable news? We have more than one black Santa in our home, as I’m sure other people do too, does anyone really think me or anyone else is going to throw our hands up and say, “Oh no, I can’t use these anymore.” Of course not. That is the beauty in a fictional character: He or she can be made to look like whatever we want. I argue we should push for an Asian Santa that is all tatted up with a Mohawk haircut. That would be awesome. But Jesus, oh Jesus is another issue. The biblical/historical Jesus was most certainly not white in the sense Megyn Kelly and white supremacists have in mind. He was a Semite male in North Africa 2000 years ago, long before blond haired,blue eyed genetics were introduced to people outside of Northern Europe. 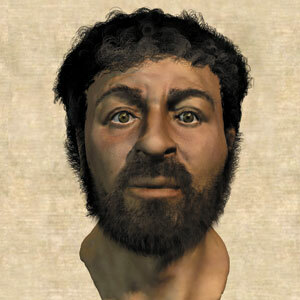 Jesus probably had curly hair and a curly beard, darkish skin and probably resembled more closely people from North Africa today. Here is a wonderful picture compiled years ago by Popular Mechanics. What confuses me is, aren’t we smarter than this? Doesn’t everyone know this stuff already? For crying out loud I can’t believe this is the public discourse we are having when there are so many other things to be outraged about like the NSA surveillance program, a nuclear Iran, what the deuce is going on in Syria, North Korea has been taken over by Sonny Corleone, China is playing chicken with our navy vessels, and that is before we ever get to things like economics, jobs, poverty, and homelessness. Now for the second issue blowing up my Facebook newsfeed, and that is the Gay Duck Dynasty issue (Wow, that sounds like something far different than it really is, or maybe just when I write it like that it feels even weirder). This probably should be a whole other blog post, but no one here has time for that. Let me make three disclaimers, though, before I continue. Disclaimer One: I have never seen a complete episode of Duck Dynasty. I watched about five minutes one time and decided that it looked too much like family reunions. Disclaimer Two: As a Christ-follower who takes the Bible seriously, I believe homosexuality is a sin. Disclaimer Three: In a free society, people should be able to live how they want to. In other words, my beliefs should not curtail another’s constitutional rights. So those are my disclaimers. Now, having put my cards on the table, let’s evaluate what appears to have happened and why I am confused. One of the Duck Dynasty stars (or was it his beard?) recently made comments in an interview with GQ that he did not approve of the homosexual lifestyle. I think this is the one named Phil. His network, A&E summarily suspended him. You can click here for CNN’s coverage and their excerpt of the weird interview. I mean, what kind of questions were they asking this Phil guy anyway? I am confused on three fronts. My first confusion is, this interview was in GQ? Really? I mean, I like the guy’s beard and all, but he hardly seems GQish. Talk about gender blender, I mean, straight men really don’t read GQ anymore and the Duck Dynasty market doesn’t seem to match their demographics. My second confusion is why are people surprised that A&E suspended this guy. You live by the sword, you die by the sword. Those Duck Dynasty guys have made a ton of cash and I see their confused looking faces all over Wal-Mart. If you make a deal with culture, you have to play by culture’s rules. That is the way it works. No one is suppressing this guy’s right to free speech, its just that he violated the core values of his employer and is paying the price. I agree with the general tenor of his statements (although I wouldn’t word it quite in the detailed and somewhat disturbing way he does) but he works in the media now and his income is tied to what he says. My third confusion is, what did A&E expect? Do his opinions surprise you that much? Really? I doth think you protesteth too much. In other words, I suspect ratings were beginning to slip and therefore some controversy had to be ginned up. Yep, that is what this whole Duck Dynasty thing feels like to me. why thank you joe. did you enjoy your birthday? Very much so. I am officially forty plus a driving-age-teenager now. I watched a very interesting documentary on J.D. Salinger last night on Netflix. Check it out sometime. Syria– with snow falling starving refugees, we’re wasting time on Duck Dynasty? North Korea– oh, yeah, duck guys are way more important than a paranoid, nuclear-armed state going through an internal power struggle. Our culture’s priorities are screeeewwwwweeeedd up. agreed. we suffer from collective adhd. thank you sarah, for reading and commenting. i really do appreciate it. polarization has allowed the crazies to take over, but that is another blog post. Jamie you did it again. I’m to the point I can’t even see as I’m laughing to hard. You have become a “routine 9:30 reading” in my part of the world. You see the world as it should be seen, with a little humor. Of the many qualities found within your blog I find so worthy is your love of research and the truth, though I would not have thought to look for a picture of Jesus, in Popular Mechanics. You know I have been known to travel down a path named “the most off the wall comments” in the past, but I bow down to you and take a seat because of your “Asian Santa that is all tatted up with a Mohawk haircut” comment is simply awesome. why thank you phil. most of life is funny, or at the very least not nearly as serious as most people take it. merry christmas! I would completely agree that it is a publicity stunt, but with the LGBT protest and involvement with the issue I’m left wondering how they will pick up the pieces. Since my family reunions were filled with Jewish people in hotels, mansions, and restaurants I enjoy the shows focus on the family. The whole white Santa/Jesus thing played out as it should have. Megyn Kelly is certainly a person who opens her mouth, but forgets what she has said on an issue months before. I also don’t have respect for her in the sense that she consistently deflects the blame for her actions onto others and gives insincere apologies when they are (seldom) offered. Jon Stewart is a man who spreads the “love” pretty equally across the parties… Just kidding, but I do enjoy watching his show when both parties are in fault. Daniel, I have to agree with you in part. Megyn Kelly is nothing but a talking head. If she spoke the words “professional Journalism” her tongue would catch fire. Little does she understand that the responsibility of journalists/reporter is to provide fair, balanced and accurate information in a comprehensive, timely and ethical manner. Jon Stewart on the other hand is a man who spreads the “love” pretty equally across the parties… I agree with this. I disagree with you when you say “Just kidding”. It just looks like he picks on one side because they give such an abundance of ammunition. I guess what leaves me scratching my head is why, as a society, we allow these elected persons in office after they lie to us, make stupid moronic statements in a public forum and expect us to believe in them. When I was growing up our parents and grandparents called them irrational, ridiculous, crazy people. Now days we elect them to a public office. Well the voices say it’s time for me to get off the computer, take my meds and be locked in my room. See you next time. enjoy sleepy time phil. the world will need you refreshed tomorrow to combat all the wingnuts. oh jon stewart is hilarious. he does skewer the right and forgives the left a little much, but that doesn’t make him any less funny. as to the lgbt pressure, i think what they’ll end up doing is some kind of episode where they all meet up–imagine the scene of new york lgbt types on the bayou. must see tv? thanks for reading daniel, and commenting. i am grateful for you. More on the white Santa thing… Some teacher told a black kid dressed as Santa that he was inappropriate, because “Santa is white”. And loved the post. Having never even seen a clip of Duck Dynasty, I have no clue what the show is like, but it all smacks publicity stunt/ratings push. wow. i can see telling any kid that dressing up is inappropriate or distracting, but telling a kid that because he is black and santa is white that he is inappropriate. wow. just crazy. thanks for reading darcy, and commenting. so sad. that poor, confused, child. We love Duck Dynasty, we have it on dvd. I agree with what you said. Why on earth was the interviewer even asking Phil those questions and why is anyone surprised that he said that? Oh well. Hopefully it’ll blow over, we really like the show. thanks for reading and commenting megan. i don’t think they want it to blow over–it is quite the media buzz and that is exactly what A&E did, just in time for people to buy DD merchandise for christmas. I’m still stuck on him being interviewed by GQ. But I’ve never read GQ and I’ve never seen duck dynasty (when my newsfeed starting talking about them, I had to ask Griff who they even were, I was picturing the Mighty Ducks movie) but based on what he said…GQ? As a side note, I’m going to start coming here whenever something shows up on my newsfeed that is everyone is so upset about that I’ve never heard of, so keep up the good work. thanks joan–i guess it is just another service i provide. i appreciate you reading and commenting. Well said. My children got me a face book page. I was ambushed and I have 70 friends already. I am trying not to do more than one status update per day and an occasional share, but some of those friends are cranking it out, let me tell you. And I get both sides of the aisle, liberal and conservative – I’m a pretty diverse guy with my friends. The other 60 are caught in the cross-fire and wondering what happened to their nice face book experience. It is an emotional roller coaster and so far kind of fun. i most certainly shall. facebook can be fun. it can also, sometimes, feel like work. I agree with you 100% on this post. Totally. Well done, sir. thanks david. the longer i think on it, the more i feel it was all a publicity stunt.